Anxiety is a normal human emotion that everyone feels from time to time. 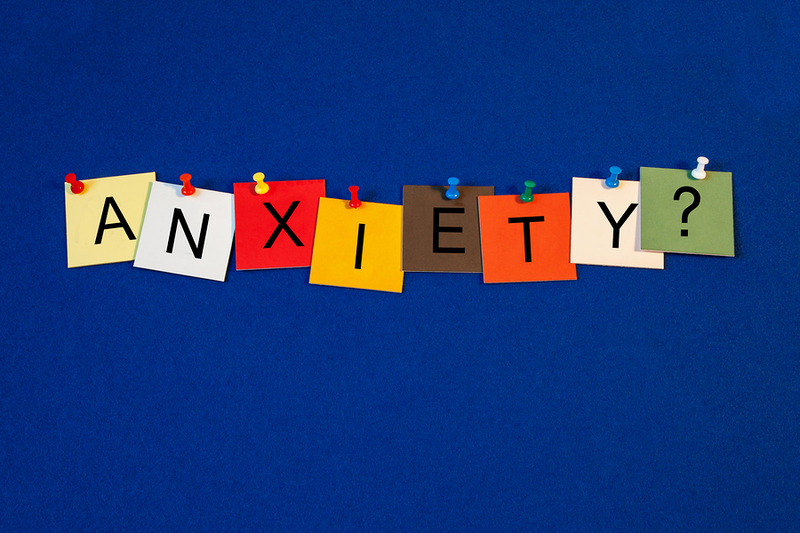 However, you need to learn how to manage anxiety, because if left unmanaged, anxiety can become a psychological disorder that is characterized by excessive uneasiness and apprehension. It can also result in compulsive behavior or panic attacks (ready my post about anxiety and panic attacks here). The emotion family that you’re experiencing with anxiety is fear (read about the Big 8 Emotion Families here). Fear occurs when you perceive something as threatening and think that you can’t handle it. You (and your brain) make an interpretation of what has happened or what will happen, and boom—you’re experiencing fear (anxiety, stress, worry, apprehension, panic). Unfortunately we can’t just will away our fears, or any emotion for that matter. However, we can begin to change how we feel by changing how we think and how we behave (these are the two stars of Cognitive Behavior Therapy). By looking at the definition of fear, it’s clear that the key to managing your fear and anxiety is to understand your thoughts and determine what is causing your fear. What you think determines how you feel (anxious), and often times you can be wrong about what you think. However, if you challenge your thoughts, you can change how you feel by changing what you think. Some of your thoughts will come instantaneously and are lead by Emotion Mind, so they don’t want to be bothered by facts and cannot be relied on to present a logical or objective case. These thoughts are also prone to unrealistically distorting your experiences. Additional thoughts also develop over time as you replay or reflect on what happened—how you think through something, how you explain it to yourself, what you make of it, and what sticks with you. All of these thoughts, the immediate and the ruminating thoughts that occur over time, offer opportunities for changing how you feel by changing how you think. You can’t stop a thought from popping into your head, but you can decide whether or not to let it take root, weed it out, or give it a more desirable and lasting shape. Before you begin to challenge your thoughts and reduce anxiety, you need to calm your body by doing a short relaxation practice for a few minutes. When you’re most anxious your brain actually shuts down your ability to think creatively or flexibly because it just wants to keep you safe and isn’t concerned with having you challenge your thoughts about anything. So calming your body’s fight or flight response through relaxation is one of the first steps that allows you to be present, clearing some mental clutter for you to transition to Wise Mind. Once you’ve calmed down a bit you’re ready to challenge the thoughts that might be contributing to your fear, stress and anxiety. We all tend to think in some common distorted ways and fall into the pitfalls of negative thinking when dealing with stress and anxiety (here’s a post I wrote that lists the eight most common negative thinking patterns). Usually just noticing that you’re having these distorted thoughts is enough to get you to stop and help you start to feel better. Is this really as dangerous or as threatening as I think? Is there any evidence to suggest that there might be another way of thinking about this? Am I overlooking any strengths in me, or positives in the situation? What would I say to a close friend if they were thinking this way, and what would they say to me? What could I do to cope with this better? By challenging your thoughts in this way you’ll bring the threat level of the situation down. This is a strategy you can use in any situation. For example, if you’re experiencing social anxiety about attending a party, you might think no one will talk to you, that you’re going to embarrass yourself, or that people will think you’re boring. But what evidence is there to support this way of thinking? Have you ever gone to a party where absolutely no one talked to you? Probably not. Are there any strengths that you’re overlooking, like how you have a lot in common with the people who will be at this party? What would a friend say about your thoughts? Would she remind you that you always feel this way before a party but after 15-minutes you’re having a great time? What could you do to cope with this better? How about taking a few minutes before you go to the party to replay in your mind the last time you were at a party and had fun—the one where all your fears were proven to be unfounded! Practicing Wise Mind Living will help reduce anxiety and the suffering it causes. However, if your anxiety has reached a disturbing level of intensity that goes beyond everyday stress, that might be an indication that you need to seek professional help. If your anxiety is lasting weeks or months, or is having a detrimental impact on your life or causing destructive behaviors, these are also indicators that you might want to seek professional help. You can find a list of mental health hotlines here.